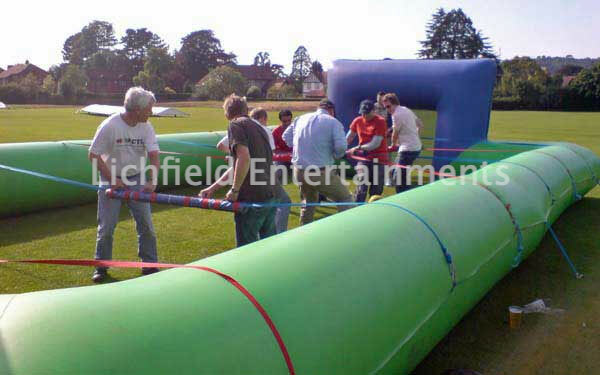 Human Table Football hire - Lichfield Entertainments UK. Our Human Table Football Inflatable is a giant human version of the favourite pub game and perfect for team building, fundays, and any football themed event. It's supplied complete with a fully trained member of staff who will organise tournaments or leagues as required and they'll also referee the games for you. Our Human Table Football Inflatable is played on a 5-a-side basis with the players holding onto the tube handles that slide side to side on the straps that run across the inflatable - this limits players to sideways movement only and the players will have to work together to be successful. The Human Table Football inflatable measures 38x25ft but needs an overall operating area of 45x35ft. If there's no mains electric then we can include a petrol engined blower. No football skills are necessary to play Human Table Football and this activity is suitable for both kids and adults. Our Human Table Football Inflatable is great game for team building, corporate events, family fundays, parties, and BBQ's. Why not also consider Giant Football Darts or a Penalty Shootout game or Footpool? If you have any queries, questions or would like to hire Human Table Football Inflatable, please click here to enquire and we will do all we can to help.